Widespread implementation of pumped-hydro is the only simple fix for global warming. It will radically cut CO2 emissions without putting up the price of electricity. Pumped-Hydro provides a means to store “electricity energy” that is not immediately required. It does this by using this energy to pump water uphill. Later, when this energy is actually required by the users on the electricity grid, it can be quickly converted back into electricity by allowing the water to run down the pipes used to pump it uphill, thereby turning the generators at the bottom of the hill (being the same “devices” used to pump the water uphill in the earlier stage). The losses from this “storage process” are minimal, and actually have a very low cost. Most of the costs arising from this process relate to the need to build water storage, pipes and electricity generators (which also serve as the pumps). In Australia, there is a great need to be able to store this surplus generated electricity, since electricity generation from wind does not match the demand pattern. This is beautifully illustrated by this set of graphs from a study of Wind generation in South Australia. Here the demand is shown in the top graph, and supply from wind is shown in the bottom three graph, broken up into three regions of South Australia. As can be seen here, the largest generation region actually generates most electricity during the off-peak period from 2200 to 0600. At present, this large imbalance has had a very bad effect – it has led to the Alinta generators at Pt Augusta being shut down, since they could no longer be run 24 hours a day. They couldn’t compete with electricity supplied at a negative cost from these wind farms – a distortion created by a dysfunctional renewable energy certificate scheme. A better fix would be to utilize the storage capability of pumped hydro. Electricity is generated from wind energy for 24 hours a day: the quantum dispatched depends upon the wind and not upon electricity demand. Electricity generated during times of low demand is effectively squandered unless it is stored. The primary storage mechanism currently available is hydro-pumped storage, which is the central plank (with wind power) for Portugal achieving over 50% renewable energy. It is also used in Denmark, where existing hydro facilities in Norway and Sweden are used to recycle otherwise wasted wind-power electricity. 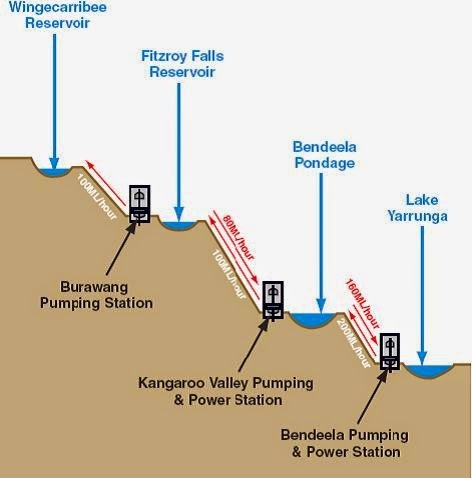 In Australia, pumped hydro could be implemented in NSW at the Fitzroy Fall Reservoir. This is a part of the water storage facility on the Shoalhaven River. At present it is mostly used to condition electricity generated by wind farms. Something more is required. It is easily understood that electricity is generated by wind at times when it is not needed, this being an issue especially during the night. On the other hand, wind generators have no capacity to increase output during times of peak demand. Indeed, the extra electricity generated during these off-peak times adds to significant inefficiencies in the total supply system, with other generators having to be shut down to accommodate the additional power being produced from wind. This has happened in South Australia, where the Pt August brown coal generators became uneconomic, simply because they couldn’t be run for 24 hours a day, as they were originally designed to do. The conventional solution to this “over-supply problem” is to store the electricity generated during the off-peak times using pumped-hydro. For example, Denmark do this with their wind energy, selling it to Norway and Sweden, who store it in their hydro systems, using this system “as a battery,” by pumping water uphill, and then releasing it later. These countries then sell the electricity back into the European grid at a higher cost than they bought it, thus providing themselves with a nice little earner. Using pumped-hydro power in this way can be easily accommodated as part of a wider hydro-electric scheme, such as in Norway, Sweden, and in the Australian Snowy Mountains and at Fitzroy Falls. The question remains whether a pumped-hydro electric scheme can be developed that has its sole justification in this kind of storage and release arrangement. Electricity is purchased at $A25 MWh at off-peak times. Even with a 25% efficiency loss, this would only equate to $A31 MWh. Electricity could be sold at $A275 MWh at peak times. The electricity dispatch could be run for 6 hours every weekday, for 52 weeks a year. Cash flow from direct operating costs would be $A244 per MWh for peak electricity sold, and $A129 MWh for Shoulder tariff electricity sold. If it were to run for one year, 6 hours per day, 52 weeks a year, 5 days a week, 90% of the time, it would return a cash flow of up to $A340,000 per year per MW installed, just for peak-load supply. If it were to run for one year, 12 hours a week, supply Shoulder tariff electricity, it would return an extra cash flow of $A80,000 per year per MW installed. Total direct cash flow would be $A420,000 per MW installed. Operating costs could be managed to be around 2.5% of installed cost. Allowing for operating costs of 2.5%, and a 10 year payback period, it will be economic to install such a facility, provided the cost of such an installation worked out to be up to $A3.5m per MW. Thus, with proper planning is should be possible to deliver a profitable operation, without actually increasing the cost of electricity as delivered. One should also be able to see the potential to actually reduce the cost of delivered electricity, once sufficient pumped-hydro facilities have been build and commissioned, especially if they began their life as government funded facilities. For those interested in following up this issue, I draw your attention to a December 2016 Engineers Australia article (p.46-53) which reported that Professor Andrew Blakers, ANU, observed that pumped-hydro has a cost impact that is a fraction of battery backups. Blakers is reported to say that, in order to be cost competitive, the system should have modern high-quality turbines, 10 MW or greater, with the “top dam” being 400-900m above the “bottom dam”. They should also be “off-river.” He also commented that such facilities would not be difficult to site. While Australian government funded ARENA seem to be happy to fund projects, such as the Kidson solar + pumped-hydro, there seems to be some problem with wind + pumped-hydro. This points to a fundamental problem with ARENA and other government funding and private advocacy organizations. For them, it seems that it must be solar, nuclear, or nothing. To hell with cost. Surely this cannot continue. Contact your MP and demand that action be taken that will reduce the cost of electricity, not just funding “lovely to have” projects, as seems to be the case at the moment. Actually, the best option for increased pumped hydro is via the Snowy Mountain scheme, where it is likely that Tumut 3 power station could be upgraded to handle all the surplus electricity generated from wind farms throughout the National Electricity Market. The other “useless argument” is put forward by nuclear energy advocates. They don’t want anything to dampen their advocacy for that lost cause. Unable to really respond constructively to the risks indicated by the failures at Chernobyl and Fukushima, they attack pumped hydro as an improbable solution to the problem of a lack of consistent supply of electricity with non-arguments. We can forget about them until they can properly address voters’ legitimate concern about uranium nuclear. More serious is the fact that the installation of a new 500 MW pumped hydro system in Germany because there is insufficient “surplus electricity” in that country. So it is the case, although they were prepared to go ahead with their plans when the ratio between average peak demand and average demand was 1.2 to 1.0. They delayed their plans when the ratio dropped to 1.1 to 1.0, which has been attributed to solar PV, which has taken the edge off peak demand, even though it remains a relatively minor contributor to total electricity supply. However, in South Australia the ratio between average peak demand and average demand is 1.4 to 1.0. If Australia were Germany, the extra capacity would be installed immediately. It is time we left behind the dead arguments of 2007, and examined propositions more appropriate for 2017 and beyond. Anyone who is concerned about global warming and climate change could surely not vote for a party that advocates an out-of-date, and ineffective, solution to the problem of too much CO2 in the atmosphere. Here the most vigorous advocates of action on this subject need to look carefully at their own motivation, for surely others will do the same. Update 10 February 2017. Now we discover that the REC scheme is even causing gas fired generators to be turned off. This situation is ridiculous. Who would seriously contemplate implementing a scheme that encouraged wind-farm operators to produce electricity in the middle of the night, when it is not needed? The Australian government did, via the REC scheme, in 2000. Surely it is the responsibility of governments to implement policies that result in a stable electricity supply, not an unstable one! Under the current REC scheme, wind-farms can even deliver electricity to the grid at a negative price, since this apparent loss can be offset by approximately $25 per MWh. This is currently the approximate rated proceeds for each certificate produced, whether the electricity generated is really needed for successful grid operation or not. The electricity retailers buy this undifferentiated certificate, since this helps them to meet their “renewable obligations,” and they have no need or way to differentiate such certificates for themselves. The downside of this is approach is that coal-fired generators (and nuclear for that matter), cannot be affordably run if they have to be shut down every day because there is insufficient demand from the grid for the electricity they would generate during the night. Unlike a wind-farm, coal-fired generated cannot be just “run on idle,” since they need the back-force of generating the electricity to offset the fierce power of their steam-driven turbines. Yet Alinta’s Port Augusta coal fired generators were turned off at night, causing Alinta’s operation to be unprofitable, and therefore to be shut down forever. Who would support a scheme that caused the former back-bone of the South Australian electricity supply market to be shut down prematurely, causing unemployment in Port Augusta, and for South Australian businesses to consider moving interstate? The South Australian Labor government did and still does. It is ideological madness to continue with this short-sighted approach, involving undifferentiated “Certificates” that do not distinguish between the “no need” electricity pushed into the grid by wind-power during the night, and the truly “useful” electricity generated by wind-power during the day. Did the South Australian government know that too much wind-power was already causing disruption to the electricity supply in 2011? Yes. That was when an academic study showed the problems in the supply situation and called for an upgrade to the high voltage inter-connector to Victorian brown-coal backup power, as a way to address the difficulties. (My 2012 comments on this report can be found here.) So the inter-connector was upgraded, which led to even more wind-farms being installed in South Australia. Folly, built upon folly. The risk to the wind-power project is palpable. Yet wind-farms (and nuclear – but who wants that after Chernobyl & Fukushima?) are the only current viable solution to the need for long-term renewable electricity supply. Despite the support of the Greens & government funded ARENA, current generation solar is a mickey-mouse solution, only able to supply electricity economically at the household level, not at the grid level, with or without batteries, except during peak periods. Of the ARENA funded solar projects, only the Genex proposal to use grid-supplied electricity to create pumped-hydro electricity makes sense. This is a Queensland project, a state where there is almost no wind-power, despite the Queensland government dreamland proposal for a rapid uptake of renewable energy. Grid-supplied electricity, generated overnight and purchased from the grid for about $25 MWh, and sold back to the grid at $275 MWh can make good logical sense, provided the capital cost is not too high. Pumped-hydro will deliver a stable electricity supply. This particularly applies to wind-power, because most wind-power is generated at night, when the wind blows more strongly, but also when it is not needed. By utilizing pumped hydro, “unneeded” electricity can be stored over the whole night and then released during the day. Yet it is not happening. Obviously there needs to be a push to force governments and the wind-farm industry to utilize pumped hydro. This can be achieved just by encouraging the Australian government to tweak the REC scheme. My proposal is that RECs should NOT be counted if the electricity is generated in off-peak periods (10 pm to 7 am). This will allow the market-distorting effect of undifferentiated RECs to be eliminated. Excluding electricity generated during off-peak periods means that wind-power will not soak up all the available demand during the night. Therefore there will be sufficient demand for base-load generators to keep working all night, and that unnecessary, costly, inefficient, and high carbon-emitting shut-downs and start-ups will be avoided. While it may be too late for Alinta’s Pt Augusta plants to be re-instated, it could allow the remaining Victorian Latrobe Valley generators to keep working until there is sufficient wind + pumped hydro capacity to permit them to be finally and rationally phased out. It could also mean that Engie’s Pelikan Point facility could be kept running. While the concept outlined here may be a challenge for Greens voters and politicians, they should get on board. It is the only currently viable approach to achieving the higher level of renewable energy generation that they would prefer. At least, if the current REC scheme is continued, they are likely to see the de-industrialization of South Australia, so perhaps they will rejoice over that! In the Australian system, given the highly politicized nature of the debate on this subject, changes to the REC target are likely to be too difficult to implement. This applies even though such changes would be needed to effectively keep the current arrangements in place. Therefore, it is proposed that no change be made to the REC Targets, but rather that, after this scheme is implemented, renewable energy providers be allow to issue a REC for each 0.625 MWh generated (rather the current arrangement of 1 REC per 1 MWh).